Yes, it's another oldie re-release - but this one's a goodie. It's got a Frenchman playing a Scotsman and a Scotsman playing a Spaniard, it's got a cheesy Queen soundtrack and there are decapitations aplenty. Yes, 1986's Highlander is definitely one film that can be termed a 'cult classic'. Which is why it's good news that Optimum Releasing have announced the release of Highlander: Immortal Edition in a digitally restored Special Edition DVD on February 26th, priced at £17.99. This new 2-disc edition features a brand new and exclusive Director’s Commentary as well as a new and exclusive 90 minute 'Making Of' documentary, plus a trailer and a Christopher Lambert interview. Oh yes! All together now; "I am Connor MacLeod of the Clan MacLeod. I was born in 1518 in the village of Glenfinnan on the shores of Loch Shiel. And I am immortal." 1985 New York City; the Battle to end all battles. The last remaining Immortals gather together to fight to the death: decapitation alone can kill them, and victor alone can lay claim to “The Prize”. 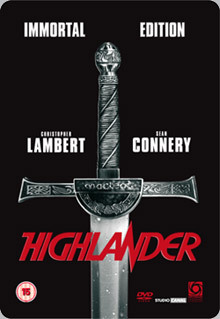 Amongst the contestants is Connor MacLeod (Christopher Lambert), who fought his first battle in 1536 on the highlands of Scotland, and his most feared opponent, the evil Kurgan (Clancy Brown) who was responsible for the death of MacLeod’s mentor, the swordsman Ramirez (Sean Connery). Also starring Roxane Hart, Jon Polito, Sheila Gish and Celia Imrie, the film was directed by Russell Mulcahy (Swimming Upstream, The Real McCoy) and features an original score by Michael Kamen and Queen. It’s another Found Footage movie - but it’s a good one!